Updated 08/01/2018. Daily schedules will feature the latest updates the day of the event. 5:00 P.M. Live Trackside on KNIA/KRLS 1320 A.M. and 95.3 F.M. 6:45 P.M. Live PPV coverage of the 360 Knoxville Nationals on theCushion.com. 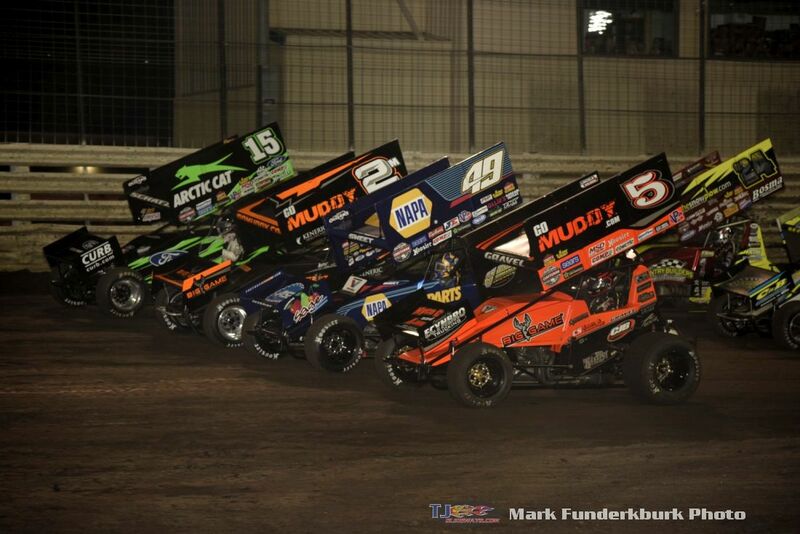 Single and multiple day pay packages available for all racing events during Nationals at Knoxville Raceway. 7:00 P.M. Racing live on KNIA/KRLS 1320 A.M. and 95.3 F.M. 2:00 P.M. – 4:00 P.M. Jon Agan appearance at Peace Tree Brewing & Taproom. Free root beer for kids with beer purchase. 6:45 P.M. Hot laps begin. 5:00 P.M. KRCO Racing Trivia and $10.00 Bottomless Bud Light Draft Party behind the front stretch grandstands. 5:00 P.M. Live Trackside on KNIA/KRLS 1320 A.M. and 95.3 FM. 12:00 P.M. Food Truck, World of Outlaws Craftsman Sprint Car Series Show Car, and Knoxville Raceway iRacing Simulator at Peace Tree Brewing in downtown Knoxville. 7:00 A.M. – 10:30 A.M. Marion County Historical Society / Lions Club breakfast. Pancakes along with Biscuits and Gravy at the Marion County Historical Village. 10:00 A.M. – 4:00 P.M: National Sprint Car Hall of Fame and Museum driver autograph sessions in the Bob Trostle Garage. 10:00 A.M. National Sprint Car Hall of Fame and Museum driver autograph sessions in the front lobby. 12:00 P.M. – 7:00 P.M. Knoxville, Iowa Chamber of Commerce Shuttle Bus runs to six locations. 7:15 P.M. Live PPV coverage of the 360 Knoxville Nationals on theCushion.com. Single and multiple day pay packages available for all racing events during Nationals at Knoxville Raceway. Post-Race Knoxville, Iowa Chamber of Commerce shuttle runs one hour after the races to stops 1, 2, 3, and 4.